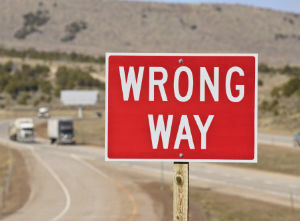 Wrong way crashes in Arizona have become an increasing problem despite efforts to warn wrong way drivers that they are entering a road or highway in the wrong direction. These types of collisions commonly occur on highways, but may also occur on local one-way streets. Victims of Phoenix wrong way accidents often suffer life-changing injuries that impact them physically, emotionally and financially. For some, the loss of a loved one in a wrong way accident is a traumatizing experience. The car accident lawyers at Phillips Law Group are committed to helping accident victims and their families obtain justice. If you or someone you love was injured in a wrong way accident, contact us for a free case review. According to the Arizona Department of Transportation, the number of wrong way crashes in Arizona have steadily increased over time, as have the number of fatalities caused by wrong way drivers. Approximately 91 people died in 245 wrong way collisions reported between 2004 and 2014. According to the ADOT, most wrong way accidents occur between 12 a.m. and 2 a.m. between Friday and Sunday. Interstate 17 has the highest rate of confirmed wrong way crashes in the state. Stretches of Route 153 and Route 51 also have a high rate of wrong way collisions. In 2014, ADOT began to roll out efforts to decrease the number of wrong way crashes. New signage was erected at various highway exit ramps, including larger “Do Not Enter” and “Wrong Way” signs. Closer to the highway, two large arrows with light reflectors signaling the direction of travel were also added. Two years later, the department is adding more red “wrong way” reflectors along off-ramps and the pavement arrows will be repainted to appear larger and brighter. As wrong way accidents continue to climb, the department has begun testing the use of electronic sensors on two exit ramps off Arizona 101. The sensors would detect if a vehicle is headed in the wrong direction, and if so, a signal will be sent to local law enforcement. Nearly every week another wrong way crash is reported, prompting questions on the effectiveness of these new safety measures and how quickly they are being put in place. The team of attorneys at Phillips Law Group have decades of legal experience helping victims of motor vehicle accidents throughout Arizona. Our firm has obtained million dollar verdicts and settlements on behalf of auto accident victims and their families. If you or someone you love has been hurt in a wrong way accident, contact us for a free case evaluation. Families who have lost a loved one due to a wrong way driver may be entitled to file a wrongful death claim. At Phillips Law Group, we work hard to protect your best interests and are here to help you make sense of your legal options and fight for the compensation you deserve. Call or text 1-800-706-3000 or fill out a Free Case Evaluation to get started.